Teachers and learners alike value opportunities for field observation. There’s just something about seeing things in the wild that’s hard to replicate in a classroom. Teaching Shakespeare? See a play. Teaching ornithology? Step outside. Teaching geology in east central Illinois? 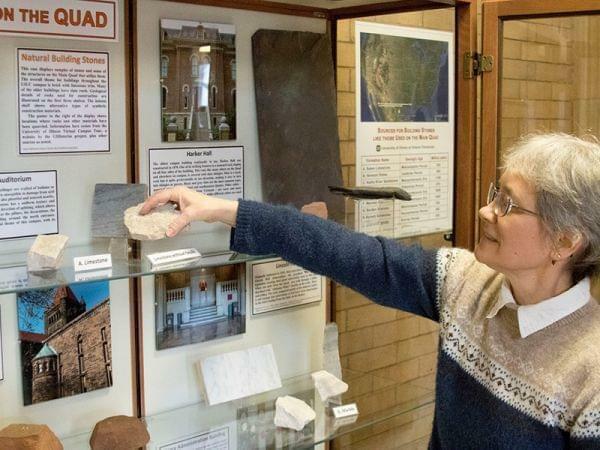 Herrstrom, who has been teaching bread-and-butter undergraduate courses in the U of I Department of Geology for 20 years, also curates the Department’s collections, which give students direct access to rocks and minerals. These collections were formerly housed in the Natural History Building, but were moved to Davenport Hall the on the main quad in summer 2014. That’s where they are likely to stay now, since that’s where the classes that use them are held. Herrstrom replaces a sample of limestone in the display. The display is actually pretty modest in size; it’s a wood and glass case about the size of a large bookcase, with just four shelves. But in that small space lives a field trip, one that you can take yourself. The upper three shelves display specimens of natural building stone accompanied by explanatory text. (The materials are like those used in campus buildings, but not actually taken from them.) There’s granite similar to what is used in the steps of Noyes Lab, marble of the sort found in Lincoln Hall, sandstone like that on the outer walls of Altgeld Hall, and more. On the wall beside the display hangs a map indicating where such materials would typically come from for buildings in this area, along with the names and ages of the rock formations from which they are taken. Some of these sites are as close as Indiana, where our limestone comes from, while others are more distant; slate used here, for example, comes from New England. One choice Herrstrom made that may surprise some people is to include synthetic building materials in the display along with the natural building stones. But those contain geological materials too. As she pointed out, “The chief ingredient in brick is clay, which we have in Illinois, and in the past quite a bit of brick was made locally.” Similarly, concrete and asphalt both contain materials that come from Illinois quarries. You can start your exploration of building materials used on the UI campus at a blog created by Herrstrom at http://publish.illinois.edu/quad-geology/. From the home page, be sure to click through to more detailed descriptions and photos. And by all means, if you’re regularly on campus, or you have occasion to visit, swing by the first floor of Davenport Hall and see the “Geology of the Quad” exhibit. From there it’s only a short way to the second floor, where the Department of Geology’s more extensive teaching collections are on display and available for anyone to see whenever the building is open. Look for them in rooms 223 and 224. Then get out and identify those stones in the wild—on buildings of the quad and elsewhere.